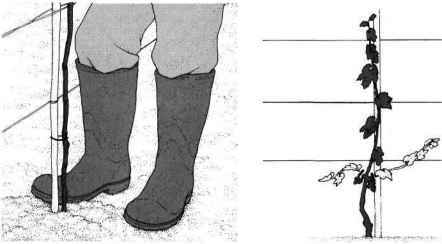 The Four-Arm Kniffin system is the method generally chosen in warm climates, but a modification called the Spur system is used for varieties such as 'Csaba' and 'Cardinal'. The Spur system allows the fruit-bearing arms to be permanent, that is they are not renewed annually. Each arm has 6-8 vertical fruiting spurs and each spur has 2-3 buds that produce fruit shoots. In cold climates, where tender varieties need winter protection, the Modified Chautauqua system can be used. Guyot system This is actually two systems. In the single Guyot system there is one fruit-carrying arm while in the double Guyot system there are two fruit-carrying arms. The double Guyot system is the more popular and is described below. 1 In spring, cut the vine down to within 15 in of the ground, leaving three buds. Train the resulting shoots vertically. Pinch back any laterals to one leaf as they develop. Each year, allow three new main stems to develop. Retain two for fruiting and cut back the others to produce replacement stems for the next year. The fruiting canes are trained close to the ground to take advantage of its radiated warmth. The trellis consists of 4-in posts spaced 8-1 Oft apart. Brace the end posts. Attach a No 12 wire to the posts 15 in above the ground and two No 14 wires so they cross at each post. 2 From April to August, train three shoots vertically from the center. Pinch back any laterals produced on them to 1 in as they develop. 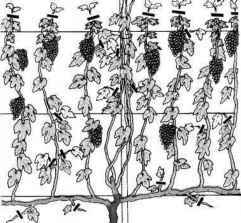 Tuck in the vertical fruit-carrying laterals through the double wires. Cut them back to three leaves. (except the first) cut back the arms that bore fruit the previous summer to the replacement spurs. Do not allow fruit on the plants in the second year after planting, but allow them in the third. Tie down on to the lowest wire one replacement shoot to the left and one to the right. Cut down the remaining spur to three or four buds to provide replacement spurs for the following year. Cut back the immature wood on the replacement spur, leaving about 2-21/2 ft of strong growth either side. 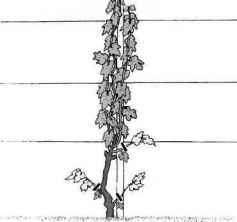 Third and subsequent years From April to August, tuck in the vertical fruit-carrying laterals between the double wires. Cut them back to two or three leaves above the top wires, as necessary, and remove any sub-laterals. Train the three replacement spurs from the center for the following year up the post. Pinch back any sub-laterals on the replacement spurs to one leaf and remove any blossom. Remove any surplus spurs coming off the main stem.